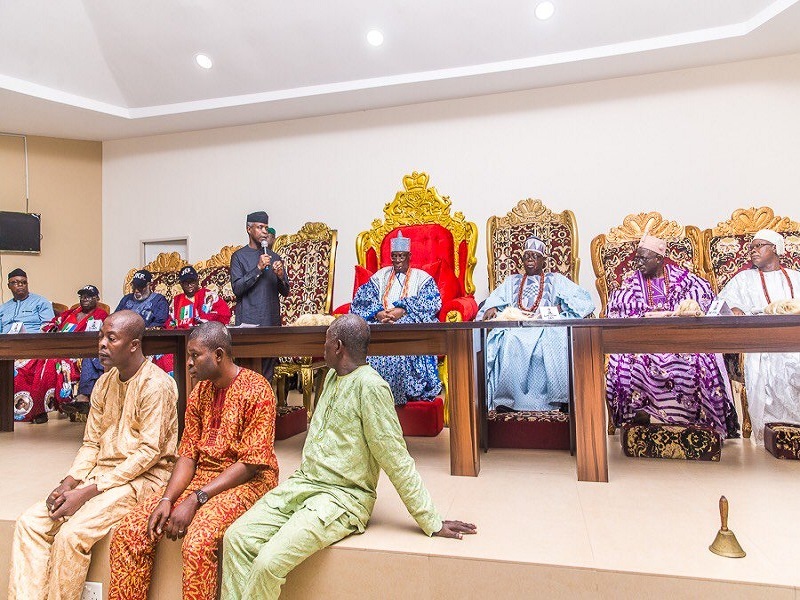 Vice President, Yemi Osinbajo on Wednesday begged Ekiti traditional rulers for not visiting them before he attended All Progressives Congress (APC) rally for governorship candidate, Dr. Kayode Fayemi. Protocol demands that top government functionaries including the President, Vice President, Governors, Ministers and diplomats pay homage to the paramount ruler of federating states whenever they visit. But Osinbajo skipped this on Tuesday, a development that attracted condemnation from the indigenes of the state and even the monarchs. “The monarchs didn’t find it funny. 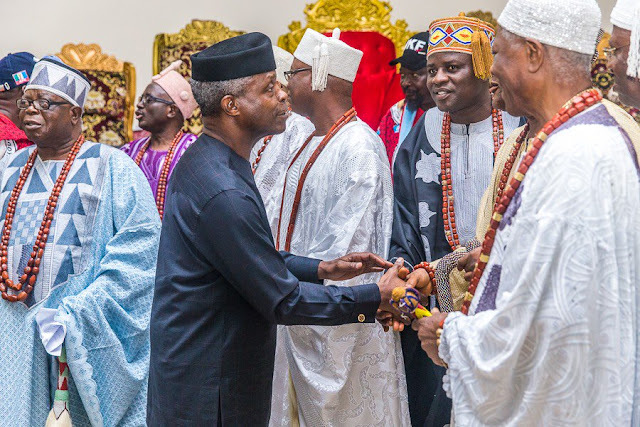 That the VP came into town went straight to the APC rally without greeting them as protocol dictates was – to them – an insult”, a source close to the council of traditional rulers told the Press. Apparently to correct the error, Osinbajo who left for Abuja after the campaign gathering on Tuesday, went back to Ekiti on Wednesday. This time, the major agenda was to pay homage to the monarchs. The Vice President, who headed straight to the palace of the Ewi of Ado, Oba Adeyemo Adejugbe, from Akure airport, apologised for his inability to pay homage to the monarchs on Tuesday. He blamed an ‘emergency assignment in Abuja’ for the situation. However, he urged traditional rulers in the state to ensure unity among people of various ethnic groups residing in their domains. Osinbajo said working for unity in their various localities would assist the Federal Government to maintain peace in Ekiti and other parts of the country. 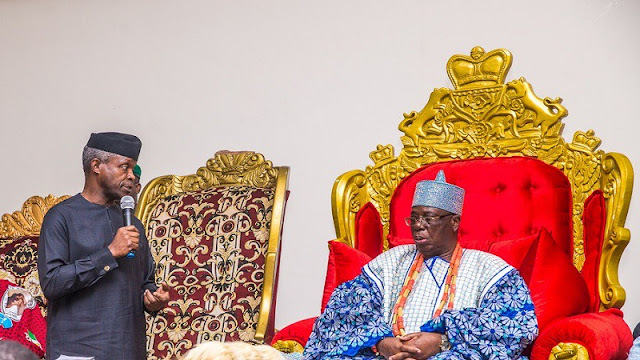 Osinbajo was accompanied on the visit by Ondo State Governor, Mr Rotimi Akeredolu, Dr Kayode Fayemi, his running mate, Chief Bisi Egbeyemi, and senior party leaders and campaign officials, appealed to monarchs to support Fayemi. He also urged them to also collaborate with key stakeholders to ensure a peaceful conduct of the poll on July 14. Responding, the Chairman of Ekiti State Council of Traditional Rulers and Oloye of Oye-Ekiti, Oba Oluwole Ademolaju, said monarchs would always support the government in executing policies that will make life easier for the masses. Oba Ademolaju lauded the Buhari administration for various achievements recorded in office. Olayinka added; “It is insulting for the APC and Fayemi to have disrespected our Obas openly yesterday, and now come back to secretly apologise to them today. “We are also surprised that the Vice President could allow Fayemi to dissuade him from paying homage to the traditional rulers. “Most importantly, it is unexplainable for the Vice President to have wasted public fund to come to Ado Ekiti twice within 24 hours just because Fayemi never regarded Obas in the State as worthy of being paid homage to. “However, like we said yesterday; “We were not surprised that Fayemi made his guests, especially the Vice President to shun the palace of Ewi of Ado Ekiti, because he cannot point to any major landmark achievement of his four years reign as governor. For four years, Fayemi promised to complete the Amphitheatre in the palace of Ewi, he never did. 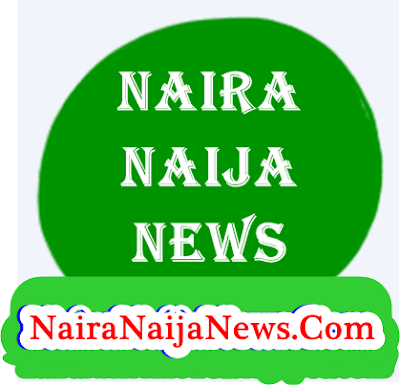 "description": "Number 1 Nigerian blog for Nigerian breaking news, naija gists, leaks, articles, celebrity gossips, sports, tops news, politics, crime, protests, etc."